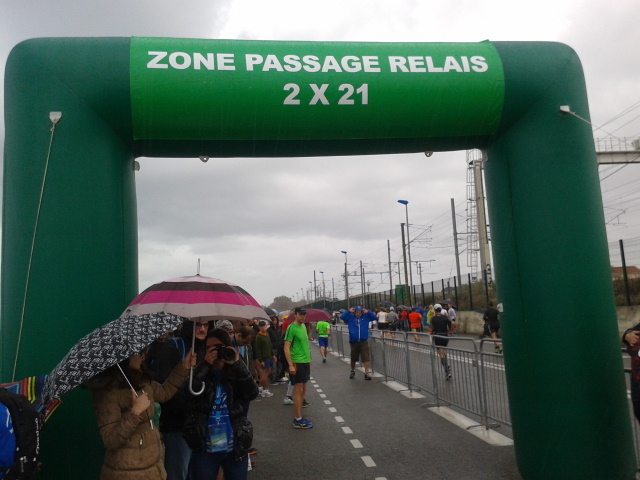 Marathon des A-M is an annual running event from Nice to Cannes organised by Azur Sport and consists of three races; marathon, 2 x 21.1 km relay, and 6 x 7 km relay. We’ve competed in the 2 x 21.1 km the last two years (team name ‘Run Dabblers’ of course!) and we’ll probably be back next year. For anyone planning on taking part in the future, we’ve summarised the course and useful race tips below. The expo is held Thursday – Saturday in a tent pitched on Promenade des Anglais, Nice and is easily accessible from the airport if you head straight there upon arrival (the airport shuttle stops nearby on this promenade). The expo is small and crammed (especially with your luggage, but still manageable). Get in and out as fast as possible as it’s like a sauna in the tent. Bib (dossard), t-shirt and goody bag pick up is first followed by the usual stalls. Bib collection is separate for each event and relay participants receive an additional bib attached to a clip belt (which contains the chip), which is for passing onto the next runner when handing over during the relay. 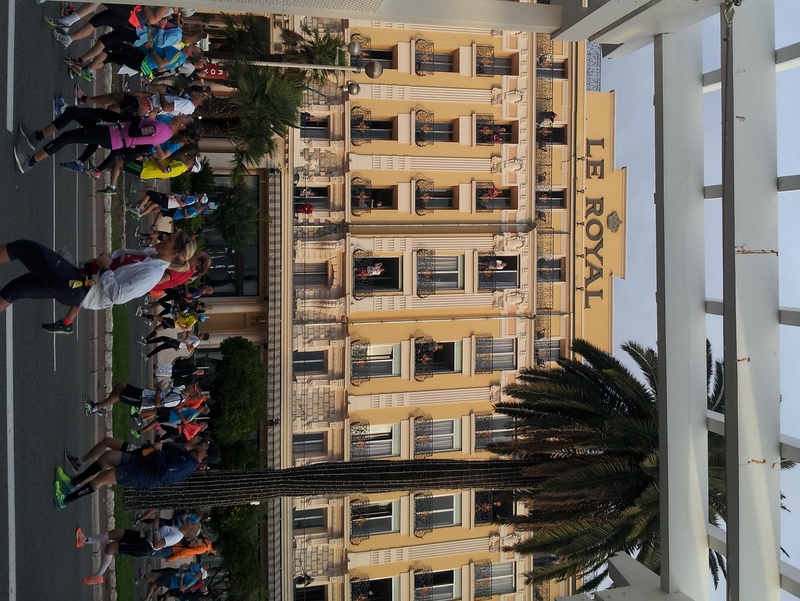 Leg 1, the flattest half of the course (ran by Ro), starts at 8 am close to where the Expo is held, opposite Théâtre de Verdure on Promenade des Anglais, Nice. If arriving from Nice train station you’ll probably pass down the main shopping street Avenue Jean Médecin. 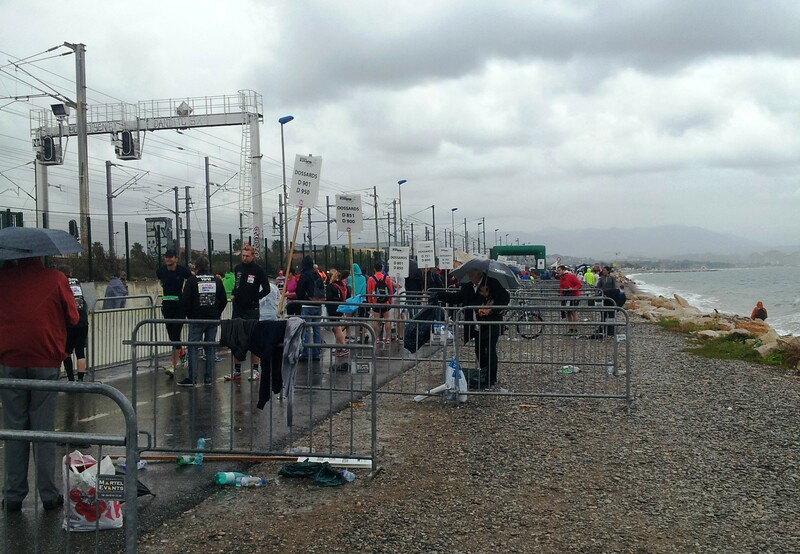 At the end of this street, before the start area, are the baggage trucks and portaloos (with very long queues). Runners enter the pen from the side streets off the boulevard. Accessibility is difficult and I’ve only ever seen one entrance through a gap in the high gates. Here everyone squeezes in. I’ve also never seen any marshalls here so if you need any help, ask another runner in your broken French. The atmosphere of the starting area is great with a DJ pumping loud dance tunes and is compered in both English and French. Dano joined me at the race start then headed back to Nice train station to jump a train to Antibes (handover point), 25 minutes away, after I started. Setting off across the start line it is a scenic 5 km sandwiched between the seaside to your left and the art deco buildings to your right, where spectators step out onto their balconies to watch the race. I positioned myself on the far left, on the footpath and close to the beachfront. Here you can look out across the water and spot the odd fisherman. If you want to be in plenty of race photos however, move to far right (where all the photographers seem to position themselves). Veering left at 5 km, immediately after Nice Airport (and close to a garden bed commonly used by runners to relieve themselves), runners move onto Route du Bord de Mer, then onto Prom de la Plage in the small commune of Cagnes sur Mer where the 10 km point is. At 7 km you will start to see the exit points of the 6 x 7 km relay participants so don’t get confused and exit with them. Refreshment stands are every 5 km from the start and sponge stations every 5 km from 7.5 km. The first deviation from the seaside road starts between 12-13 km, immediately after Hippodrome de la Côte d’Azur on your right. The course takes runners up a residential street then bends around to lead runners back down another parallel street (about 1.5 km total) and back onto the seaside road. In this residential area people stand at their gate in their pyjamas cheering on runners and one man even gets his ladder/platform on wheels out in his front yard to watch runners from. Look out for him on your right. At 15-16 km there is a deviation from the seaside road for a second time with a loop then a turn into Marina de Villeneuve-Loubet, passing the marina shops and restaurants then uphill under a small bridge onto Route du Bord de Mer for 4 km. This is the road the 2 x 21.1 relay handover occurs. This last stretch seems maybe the longest as the road just continues straight for 4 km with an uninhabited beach to your left and the train tracks to your right. Up ahead Antibes’ Fort Carre can be seen and then eventually rubber arches come into sight; the first at 19 km and the second at 21 km. The second half runners line up along the beach in numbered sections according to bib number and a quick hand over of the bib/belt is done. Just prior to handover with Ro the rain had started to come down and the wind pick up, similar to last year but without the sun. The handover area again was quite hard work. The pens where runners wait (grouped by race numbers) alongside many others runners trying to be noticed by their relay partner was like a January sales environment. Seeing my pen very busy I decided to stand in another pen closer to the start line. Stripped and ready to go keeping warm was the main thing on my mind and with the rain falling the sight of Ro in the distance approaching the handover point with bib in air was very welcomed. A quick well done and hug and I was off into the wind and wet. By now the course was less busy which gave me the opportunity to find my pace and settle in. Deciding to turn my music off I planned on enjoying my race more this time, taking in the scenery and listening to the various entertainment and cheering. My goal was to put in a fast enough time but not over do it, plus the weather conditions were making it increasingly unpleasant. 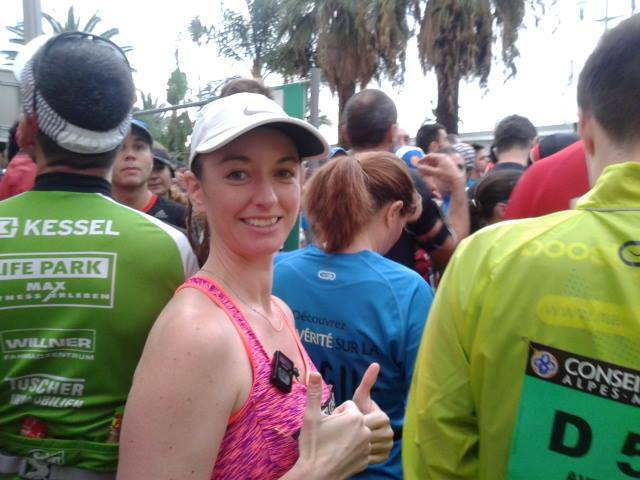 Several kilometres in and with trainers soaking wet I was back amongst the varying inclines of roads, not stopping at any waters stations – I was on a roll and powering my way through past the ever tiring marathoners. Water/feeding stations were well stocked with a mixture of fruit and power drinks with the 28 km station being the biggest. Support was decent considering the weather although some of the coastline crowds were sparse. However coming through more residential areas small pockets of crowds cheered alongside various small bands. With the course hugging the coastline coming into Cannes and seeing the boulevard in the distance, Cannes seemed to arrive quicker than it felt. Feeling strong I knew there was one more incline before the final approach to the finish line. 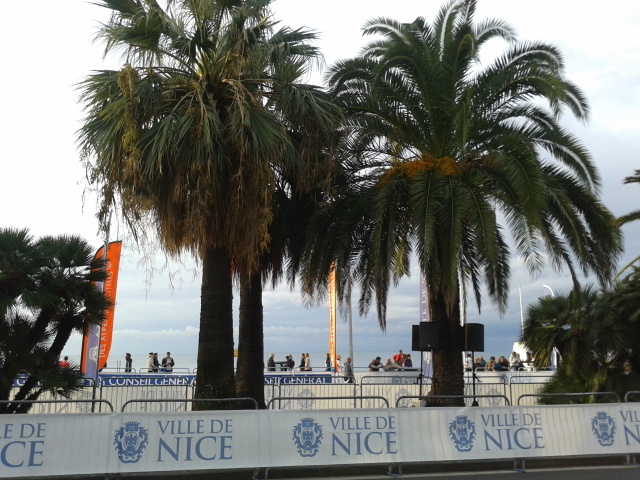 With the rain, wind and dull clouds hanging over the whole race the sight of palm trees, crowds and the finish line entertainment of Cannes was upon me. Keeping an eye out for Ro and realising my time was not a sub 1:40 as I’d hoped, I slowed down to make sure I saw Ro for a high-five. The finishing stretch and the blue carpet rolled out is a nice touch and with the crowds at their busiest and closest it really is a motivating final 100 yards or so. Across the line and diverted to the relay medal collection point, picking up both our medals which again fix together to make one, i was pleased the race was over. Not for the fact I was tired but more to get back to the hotel out of the rain, wind and to warm up. By the time I located Ro at the finishing area I was feeling very cold. Bar the weather again (it was the sun last year), I did thoroughly enjoy the race this year, maybe because I knew what to expect which in turn eased any fears I had meaning I knew I could go out there, manange the inclines and finish strong. It is a race I highly recommend and maybe one day I may run the whole marathon but what I do know and can advise is if you are going to do this race, be prepared for very unpredicatable weather. 2013 was hot and extremely windy, 2014 was very wet and windy so take note and enjoy. A medical certificate is required (letter from the Dr.) to state you are fit to compete (French law). This needs to be uploaded to your race entry prior to race, dated within 12 months prior to race date. We choose to stay in Antibes, between Nice and Cannes and relay handover location, which is a lovely town with an old town and marina. We can recommend Hotel Josse. Trains between Nice/Antibes and Antibes/Cannes are approx. 25 minutes. Tickets are required all participants on race day and will be policed tightly. The 6 x 7 relay participants however can travel free with bib number. There is also a shuttle bus option. The walk between Antibes train station to the relay handover point is about 15 minutes along the beachfront then up a small hill. Photographers are usually on the right hand side if you want photos. Baggage trucks take bags at Nice and drop them in Cannes. If the first runner wants any supplies though we’d recommend taking shared supplies in the backpack received at the expo and quickly handing over at the halfway point handover. The 98 shuttle bus from Nice Airport to Nice takes 25 minutes and tickets can be bought at the bus ticket office on the right as you exit the airport (outside). Weather can be unpredictable. Come prepared for rain and sun.